Hey! Wait a minute! 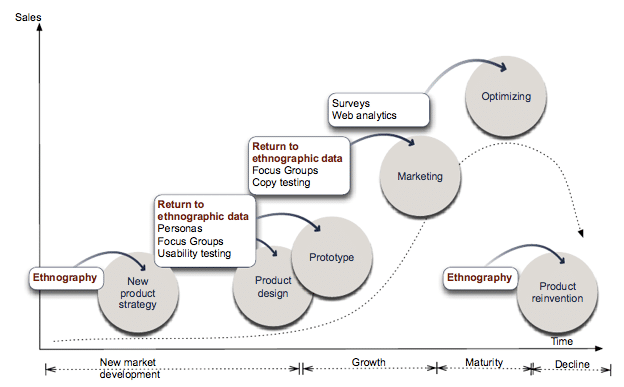 This is a UX forum; what has ethnography got to do with design at all? That’s a fair question and if you give us just a few seconds we’ll walk you through that too. Ethnography is a funny discipline and one that many of us simply don’t get that much insight into during our academic and business careers; yet it is a very useful field that has real applications in UX design. What is Ethnography and Why Should We Use It? Ethnography is basically a branch of anthropology with links to sociology. It is the detailed observation of people in their natural environments. The idea is that we can better understand people when we can see them do what they do; rather than when we ask them what they do. We should use ethnography in our UX research because it makes very clear what happens with our products “in the real world”. The researcher, metaphorically or indeed sometimes literally, will walk a mile in the user’s shoes and see exactly what delights them and what frustrates them. So How Do You Do Ethnography? It is unkind, and sadly all too common, to dismiss ethnography as an exercise that “anyone can do”. It is true that it is a fairly straightforward profession in concept. Find the group you want to observe and go and observe them. But… all too often this is not what happens in practice. What we want from research is often to test a theory. If you go to test a theory when you observe a population; you are all too likely to influence the outcome. For example; if you go to test the idea that all teenagers are a bit sullen and non-responsive to adult questioning – it is very easy to act authoritarian when asking questions and to deter the teenagers from interacting with you. You may have proven your point but you leave us no closer to understanding the true behaviour of teenagers when you do this. The true skills of the ethnographer are learning to observe, ask the right questions and at the right time, to cause minimal influence on the actions of your subjects. So in short you “do ethnography” by being immensely curious and starting your work with an open mind. You go in search of truth rather than taking your truths with you. This means that while ethnography is a very simple concept; it takes a rather deeper person to carry out the work than it might first appear. The researcher needs to become close enough with the observed parties that they are comfortable and natural in their actions around the researcher; without the researcher becoming part of the group themselves. (Many people believe that, for example, an ethnographer who studies heroin addicts is much more likely to become an addict themselves by failing to recognize the boundaries between themselves and the group effectively). How Do I Find Out More About Ethnography? You can start with our free to read and access text by Dave Randall and Mark Rouncefield; Ethnography and it’s here on the IDF website. Dave was a Principal Lecturer at Manchester Metropolitan University and Mark is a Senior Research Fellow at Lancaster University. So they’ve got plenty of valuable insight between them.